BUT… we are doing our own “Extreme Makeover” only in a much smaller sense! March 9-10, 2012. 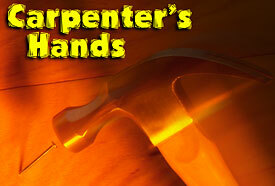 Carpenter’s Hands will be helping to do some fixing-up and maintenance on a cabin in rustic West Virginia. The group will leave on Friday evening, March 9th, work Saturday morning & afternoon, and return Saturday evening, March 10th. The group will be staying in the cabin overnight. There is no running water and it is a one-room house. Therefore, please bring warm clothing and be prepared for no inside bathroom facilities. Please call Joe Snively at 301-509-1166 for more information and to RSVP (space is limited for this trip so please reply by March 1st). Men only please as sleeping, eating and changing accommodations are all in the same room.